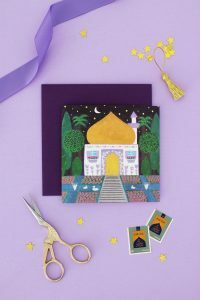 Eid Al Adha Cloche – Hello Holy Days! 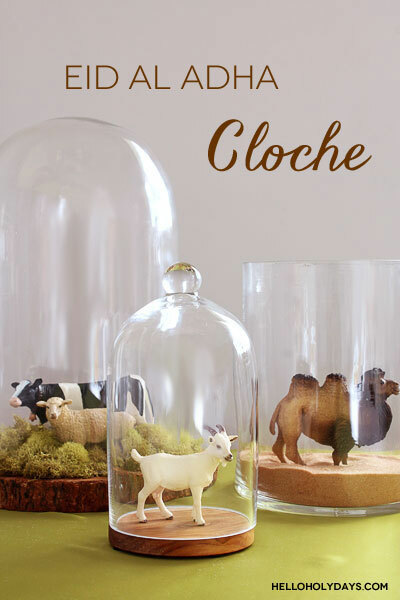 Make a cloche display for a quick and easy way to decorate for Eid al Adha! Here, we’ve featured the animals most commonly associated with Eid al Adha: sheep, goat, camels and cows. For an elegant way of representing the holiday story and traditions in your home decor, arrange cloche and vases into groups of 3 around your home. A mantle, large window, buffet or side table are all good places to display your arrangement. If you’re having a sit-down dinner, this also makes for a great centrepiece! Fill vase with sand, place camel inside. Place animals on wooden platter; for visual interest, arrange moss around some platters and leave it out on others. Cover platters with cloche and display. *To help you find the materials for this project easily, this post contains affiliate links. Hey dear, I am going to feature this beautiful idea in my blog post. I hope you will be happy to see your work featured. Feel free to visit & grab the featured button on your blog!